Congratulations to all participants and coaches who have qualified for the 2015 KHSAA State Cross Country Championships. First and foremost, I would like to thank the eight regional hosts for all of their hard work and the success of the “super regional” this past Saturday. There are several items for your review on the cross country page of the KHSAA website. The state instructions have been updated, course maps and directions to the Kentucky Horse Park are available, and the state meet time schedule is posted. 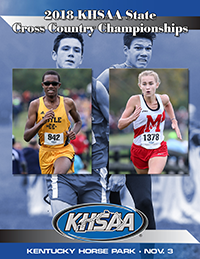 To view these items, go to http://khsaa.org/sports/fall/cross-country/ and choose “State Meet Information and Instructions”. Practice time is once again available on Friday. This is the only day that this is allowed. The times available are from 3:00 to 5:30 p.m. SafetyTec will be available for medical needs. Buses shall park in the lower lot of Alltech Arena during the practice times as course officials, many student-athletes, and KHSAA staff will be walking the area. As you have read in the instructions, two coaches will be allowed on the course this year. Coaches must be qualified coaches under Bylaw 25 (have had all the proper training, including the sports safety course and the online rules clinic). Our officials ask that coaches be aware of the course and not interfere with any runners. Please remind your parents that the campground is the only part of the KHP where spending the night is allowed. Admission gates will open at 7:30 a.m. with tickets available for $10. Kids 10-and-under are admitted free. Finally, please make sure they are aware that pets are not permitted at the Kentucky Horse Park in the area past the admission gate. We look forward to seeing you at the Kentucky Horse Park this Saturday. Order your Advance Cross Country Tickets!